The sticker is having a renaissance! People can’t get enough of them. They’re slapping them on their laptops, water bottles, phones and more. 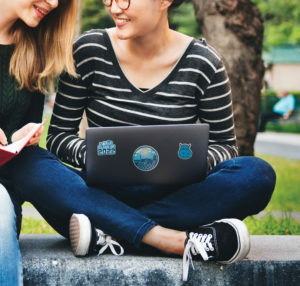 Now is your opportunity to capitalize on all this sticker excitement and turn your target audience into an army of brand ambassadors with custom stickers. Stickers are sticky. Your brand stays with the users. They can potentially see it every day. Even better, so do their peers and community. Stickers are budget-friendly. Many of our sticker options are under a dollar, allowing you to make a big impression with a relatively small investment. Stickers are lightweight and long-lasting. The perfect match. Easy to mail. Easy to carry. Easy to distribute. Plus, they “stick” around for a long time. Stickers are super social. People seem to love a good selfie. So use them to boost social media engagement. Because presentation is everything. 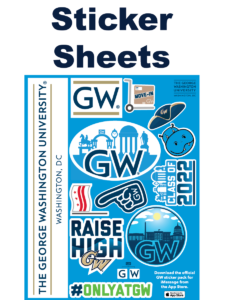 Our high-quality, full color die cut custom branded stickers are displayed on background sheets that match your institutions pantone color. This attention to detail makes for a powerful, branded presentation. Make sure that you’re getting the most out of your stickers, by paying attention to our design suggestions. Unlike stickers of old, our custom stickers, including keyboard stickers, postcard stickers and die cut sticker sheets, are worry-free because they feature a special adhesive that allows them to come off without leaving any annoying residue. Get your own custom stickers from Magellan Promotions! Our team is ready to collaborate with you to identify the sticker options that will work best for your needs – send us a message and we’ll be in touch or get your order started by checking out the options available below.